Have you ever taken the Myers-Briggs personality test? I’ve had to do it for work before. It’s fun and usually so accurate it’s frightening. Here’s an abridged version of the test, if you’d like to give it a shot. Myers-Briggs aside, I have to share a much more important personality analysis…ice cream. After a heated debate the other night with my better half over best-ever ice cream flavors, I figured somewhere out there someone surely must have decoded what your favorite flavor says about you. Turns out, Baskin Robbins has the inside scoop! 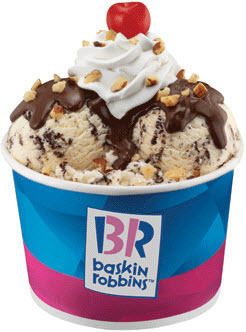 Baskin-Robbins teamed up with Dr. Alan Hirsh, founder of Smell & Taste Treatment and Research Foundation in Chicago, to understand what the most popular ice cream flavors say about someone’s personality. Vanilla // You’re more likely to be impulsive, easily suggestible and an idealist. Chocolate // You’re more likely to be dramatic, lively, charming, flirtatious, seductive and gullible. Very Berry Strawberry // You’re more likely to be a tolerant, devoted and an introvert. Mint Chocolate Chip // You’re more likely to be argumentative, frugal and cautious. Chocolate Chip Cookie Dough // You’re more likely to be ambitious, competitive and a visionary. Pralines ‘n Cream // You’re more likely to be loving, supportive and prefer to avoid the spotlight. Jamoca // You’re more likely to be scrupulous, conscientious and a moral perfectionist. Chocolate Chip // You’re more likely to be generous, competent and a go getter. Rainbow Sherbet // You’re more likely to be analytic, decisive and pessimistic. Rocky Road // You’re more likely to be aggressive, engaging and a good listener. Personally, I’m a Pralines ‘n Cream kind of gal, but I’m much more of an extrovert than described above. What’s your favorite flavor? Does the description of your personality ring true? « Spruce Street Harbor Park is a must-see!